UPDATE: ProtoShare 3.8 was successfully released on Saturday night, 3 April. All users are now on the new version. Release 3.8 is coming this weekend, April 3rd! Sorry for the short notice, but we’ve been busy testing and fixing little bugs. In an effort to streamline ProtoShare, 3.8 has several workflow changes. First, the Projects management screen has changed. My Projects has merged with Account>Manage Projects and is now called Projects. Projects are now in a sortable grid. Active projects are listed above archived projects (grayed out to indicate archived). Most importantly, the default sorting of this grid is last-opened for the current user. If you work with a lot of projects, this is a huge help. Also, when you select a project you can now invite users directly on this screen using the People tab in the right-hand sidebar. 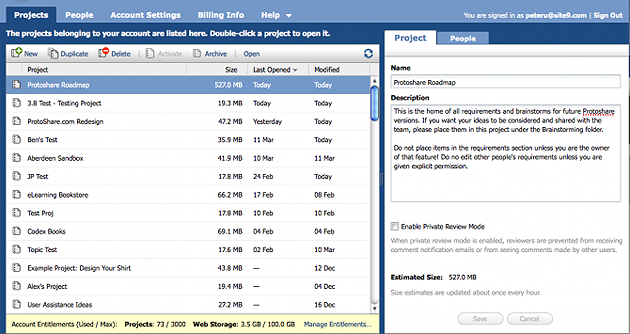 Project Entitlements are now shown in this page’s footer. Account>Manage Users is now People. Again, information is now in a sortable grid. Information about your licensed user and reviewer counts is now shown in the page’s footer. If you’re a Billing Manager, the Manage Entitlements button will take you to the Billing Info page so you can adjust your user count. Account>Settings has been moved up a level to Account Settings. The content remains the same. Account>Billing has been moved up a level to Billing Info. 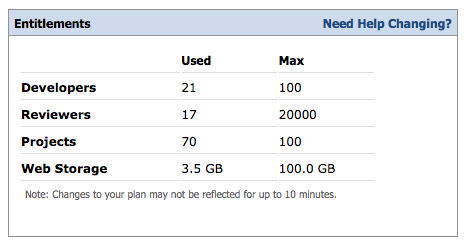 The Billing Info page now has a link labeled Need Help Changing? which leads to detailed help on managing your user entitlements. 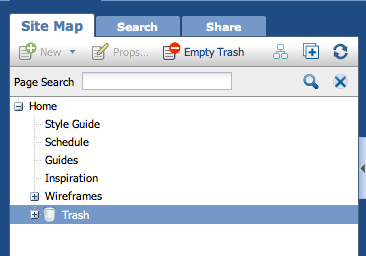 First up, the Site Map now has a trash can! Yay! Previously deleting a page was not recoverable. Now pages are first moved to the trash, then the trash can be emptied whenever you want. To recover a page, simply drag it out of the Trash. One of the biggest changes is to the View Design mode. This mode was kind of an afterthought when we originally made ProtoShare, but we decided to beef it up after hearing from so many customers that this was their preferred mode for reviewing wireframes. This toolbar can be collapsed using the X button to completely remove the ProtoShare UI. It can then be expanded using the ProtoShare icon that appears on hover, as seen in the animation below. The toolbar contains toggle controls for the Site Map pane, the Discussion/Annotation pane, the Filmstrip pane, Discussion pin overlay and Annotation pin overlay. Also there is button to place a Discussion pin or Annotation pin (if you are a Developer). This button will put you in single-click pin placement mode. Just click where you want a pin to go. No more creating a pin and dragging it out of the upper-left corner. Another difference is the right-hand Discussion/Annotation pane is now closed by default. If you click on a a discussion or annotation pin, the pane will automatically open. This gives you a little more space for the default view. We use ProtoShare as part of our daily routine and I have to say, once we put these features in place, it just felt right. I’m sure you will feel the same way. The release is scheduled for this weekend. Once you have a chance to try out the new features, leave a comment here and let us know if you like them, or what you would like to be different. Thanks! This entry was posted in ProtoShare 3.8, Release Notes. Bookmark the permalink.